Town of Greece v. Galloway: The Supreme Court upholds sectarian prayer at town meetings. The Supreme Court gives its blessing for prayer at town meetings. Get ready for a lot more Jesus in your life. 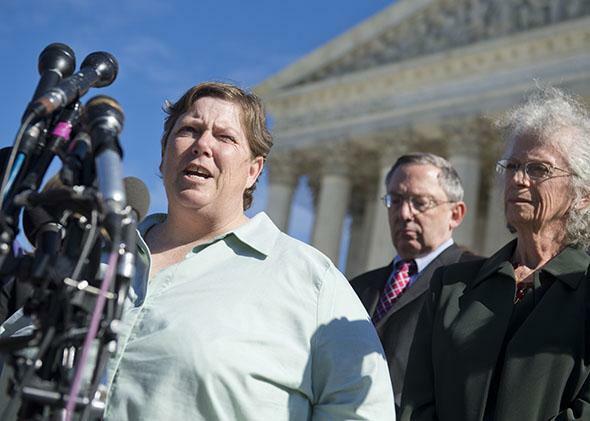 Susan Galloway (left) speaks to the media following oral arguments in Town of Greece v. Galloway outside the Supreme Court in Washington on Nov. 6, 2013. The most important turn in Monday’s Supreme Court ruling in Town of Greece v. Galloway—a case that probes the constitutionality of explicitly religious prayer in legislative sessions—isn’t that the courts no longer have a role in policing the Establishment Clause, or that pretty much any sectarian prayers can be offered at town meetings so long as they do not “threaten damnation, or preach conversion” to minority religions. No, I think the interesting change in the court’s posture today is that sectarian prayer in advance of legislative sessions is no longer characterized merely as “prayer.” In the hands of Justice Anthony Kennedy, who writes for five justices, these benedictions are now free and unfettered “prayer opportunities.” And “prayer opportunities” are, like “job creators” and “freedoms,” what make America great. Two women sued, one an atheist and the other a Jew, both contending that the First Amendment’s Establishment Clause is violated when, as here, the state sanctions a system in which Christian prayers are offered almost exclusively for nearly a decade, particularly when this occurs at sessions in which citizens in attendance must participate in order to interact with their elected representatives. The 2nd U.S. Circuit Court of Appeals agreed. Today, on the usual 5–4 lines, the Supreme Court reversed the appeals court, finding that even the overtly sectarian prayers offered in Greece do not violate the Constitution, and, more importantly, that outside of future prayers that “threaten damnation, or preach conversion,” neither state legislatures nor the judicial branch should play any role in second-guessing the religious leaders conducting prayer sessions. “To hold that invocations must be nonsectarian,” Kennedy wrote for the five-justice plurality, “would force the legislatures that sponsor prayers and the courts that are asked to decide these cases to act as supervisors and censors of religious speech.” In other words, not only did the court move the goal posts—from now on sectarian prayer will be permissible until it isn’t—but it also threw out the rule book and benched all the refs. From now on, says the court, it’s improper for government or judicial officers to second-guess the motives of the prayer policy or the prayer giver. To the extent the court ever played a role in ensuring that minority religious rights were not trammeled by well-meaning majorities who fervently believe that here in America we are all basically just country-club Judeo-Christians with different hairstyles, the jig is up: From now on we just do as the religious majorities say, so long as nobody is being damned or converted. There will be a good deal of bitterness in the coming days among members of religious minorities and majorities who believe that the Town of Greece decision is just or unjust depending largely on how they feel about sectarian Christian prayers. But stepping back from the specific arguments of the plurality and dissent, it’s fascinating to see how Kennedy and Justice Samuel Alito relentlessly characterize religion as an essentially peaceful, civilizing, lofty influence that seems to have more to do with social politeness than religious zeal. Kennedy’s majority opinion contains the complete text of four prayers, presumably to calm and unify his stressed-out reader, and he writes lovingly of prayer that is “solemn and respectful in tone, that invites lawmakers to reflect upon shared ideals and common ends before they embark on the fractious business of governing.” He seems unaware that for every solemn and respectful prayer, America offers up dozens of fiery, judgmental, even violent ones. In short, what is commonplace to Alito must by definition be so for everyone. Alito is also at pains to explain that the decade of Christian prayer in Greece was not intentional. At worst, it simply was the result of a clerical error in compiling a list of all-Christian chaplains. Again, the assumption seems to be that since—left to their own devices—polite majority religions will almost always inadvertently privilege themselves, there can be no real constitutional harm here. He does not see that this is precisely the danger. Alito and Kennedy seem convinced that religion not only civilizes and unifies us all (see Alito’s amazing discussion of the great religious unification of 1774), but that anyone not similarly elevated and inspired is just kind of lame. Perhaps because their version of religion is so sweetly polite, they’ve reimagined the refusal of dissenters to either pray along or remove themselves from the room—but in any event to stop kvetching—as civic rudeness. … to the extent coercion is relevant to the Estab­lishment Clause analysis, it is actual legal coercion that counts—not the “subtle coercive pressures” allegedly felt by respondents in this case. Thomas adds that in his view the First Amendment religion clauses don’t apply to the states in the first place. And it only probably bars the establishment of a national church—leaving open the question for another day. In other words, it makes no sense to defer to majorities in legislatures and trust their claims that “all God-fearing people” love to pray to Jesus before secular legislative sessions. That deference is too steeped in assumptions about what is ordinary, necessary, and, yes, polite. So freedom in America now means more and more sectarian “prayer opportunities” will be hand-delivered to us as we go about our daily lives. And you can be certain that here in the Land of Opportunity, more and more such “opportunities” to respect and honor and even worship along with the majority religions will be offered to us. And more and more, “freedom” will come to mean that unless you are being condemned to hell or threatened with conversion, you are free to sit quietly and give thanks that you still live in a free country. Amen.